If you looked back 10 years ago, Sekinchan would not have been on your radar for a short road trip out of KL. The sleepy farming town existed solely for agricultural purposes, with vast paddy fields and a solid supply of fresh seafood. But then, someone else saw its potential — specifically, the production people behind Hong Kong TVB drama Outbound Love. A portion of the series was filmed in Sekinchan, and it was then people started taking notice. Fast forward to the present day and you’ll find that the once sleepy town in Selangor is no longer so. More homestays and Airbnb homes have opened up for travellers to stay longer, and even hipster cafes have begun sprouting. However, what remains the same is the vast paddy field which is a sight to behold, especially when it’s just before the harvesting season and the field is a lush green. The seafood is still good — something that you certainly cannot miss out on when you make the trip up here. Take our word for it and continue reading on for our guide to Sekinchan. For such an idyllic place, it was only a matter of time before it was overtaken by perfectly Instagrammable cafes. But perhaps none are as Instagrammable as N.16 Cafe, fashioned from a bus on top of a cargo container. Patrons can choose to dine al fresco — unwise in this heat wave — or inside the bus itself. The interior of the bus has been completely redesigned, fitted with bus seats facing each other and tables. Don’t expect an extensive menu — the cafe does well with coffee and cakes, and the occasional western offerings. Naturally, the place you should make a beeline for is the traditional style Chinese restaurants that serve the freshly caught seafood. It’s truly an ocean to table concept at its most basic because the seafood you’ll be feasting on will likely have been delivered only hours ago from the boat it was caught on. Try Restoran Bagan Sekinchan in Lorong 5 or Kim Kee Restaurant Sekinchan in Lorong 4 for some extremely delicious seafood cooked in the Teochew style, which is the predominant ethnic group in this small town. Sample the deep fried battered squids, steamed crabs, and lala meehun — you won’t regret this feast. Part of the appeal of coming to Sekinchan is that they now have proper accommodations for visitors who intend on staying longer. They’re no Ritz-Carlton or the Four Seasons, but they’re chic and unique enough to pique our interest. 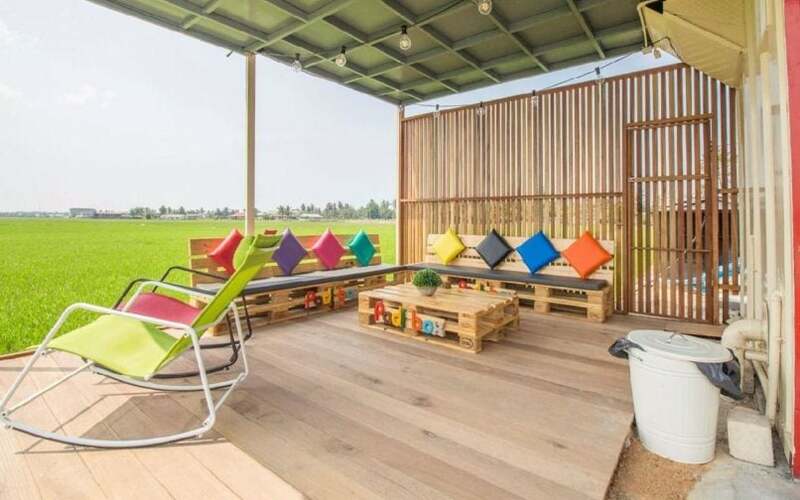 The most popular one that people will recognise is Padi Box, aptly named after its surroundings and the fact that the hotel is constructed using colourful cargo containers. It may look industrial on the outside, but it’s actually rather cosy on the inside. Natural light has been utilised alongside wooden fittings to amp up the cosiness. Alternatively, you can stay in another container hotel: Farm Ville Cafe & Homestay. Its striking red containers belie the fun that lies within — there’s not only a swimming pool in the boutique hotel but also a trampoline, and mini golf area. First things first — shop for more food at Ah Ma House Bakery, a traditional cakes and biscuits store in Sekinchan. Not only do these make great gifts for people back home, but they’re also a peek into the dying culture of traditional biscuit-making. You won’t find many places in the city making traditional biscuits such as kuih kapit, kuih bangkit, and more with a passed down grandmother’s recipe and with old tools. Next, it’s time to head over to Pantai Redang. Not to be mistaken with the pristine island over on the east coast that is Pulau Redang, Pantai Redang is still a popular gathering spot for the locals as well as tourists. Scenes from Outbound Love as well as from the local movie Mukhsin by the celebrated late director Yasmin Ahmad. Head out there for a leisurely walk along the beach, fly some kites, and savour some raw oysters in the food shacks there. Before you leave Pantai Redang, don’t forget to make a stop at the iconic Wishing Tree here. You might have noticed a tall tree with various red ribbons hanging from its branches. Those are in fact, written wishes flung on to the tree by people hoping to get some good luck in life. You can get yours done as well — just head over to the temple to purchase the red cloth, write your wish and name on it, and swing it as high as you can into the Wishing Tree. It goes without saying that the paddy fields are definitely the main attraction when visiting Sekinchan. If you don’t know where to start, just head over to the general vicinity of Jalan Tali Air and begin exploring. 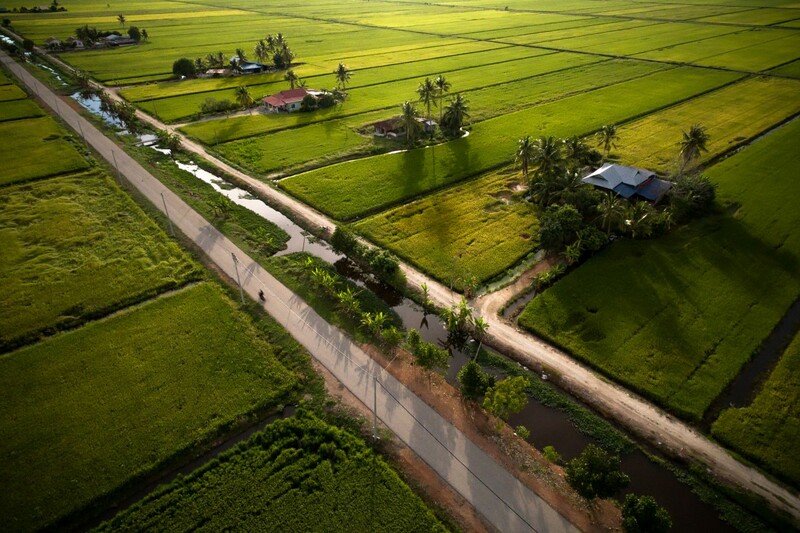 There are different times to visit the paddy fields depending on which view you’re after. If you want to see it at its greenest, visit between mid-March to May and mid-September to November. If you’d like to see it close to harvesting season when the plants are ripe with rice, visit between mid-May to June and mid-November to December. To know more about the rice that goes into your bowl, visit the Paddy Gallery. They give guided tours on how rice is planted to the harvesting process, as well as educate you on the different types of rice that are grown there.